Yoga is good for you. Could it be beneficial for your pooch? After all, they invented downward dog, right? 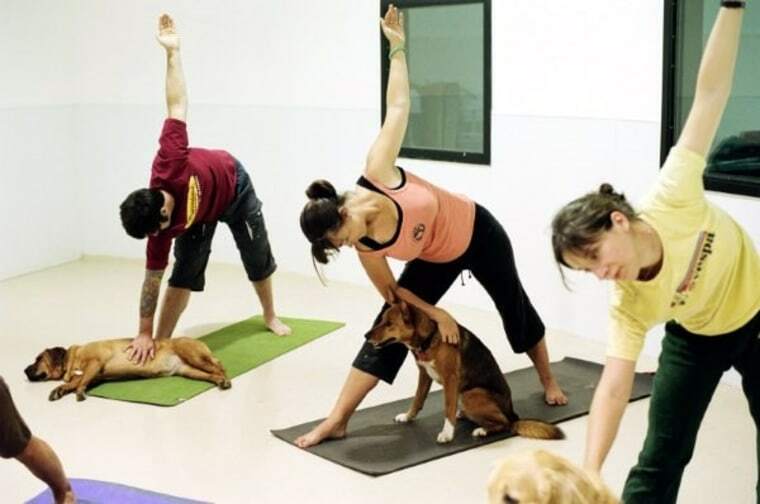 It sounds silly at first – yoga for dogs, but the people who take doggie yoga, or “doga,” classes with their canine family members can’t stop raving about it. Melba Sanchez has been doing doga with her miniature schnauzer, Kasey, for about three years now. Paula McNamer says her 12-year-old poodle, Stryder, is always excited to see the other dogs in the class, but calm and relaxed when they go home. McNamer and Sanchez take Sunday doga classes with Nicole Vykoukal, a registered yoga teacher and founder of Austin Doga. She describes her classes as an hour of quality time, filled with petting, looking into each other’s eyes and cuddling. “We do take the dogs through some gentle posses, but most of the time they’re just hanging out or snuggling with their mom or dad,” Vykoukal said. Doga typically includes massage and meditation. And yes, there’s even the Savasana relaxation pose at the end of each class. Brenda Bryan, a former Seattle yoga and doga instructor, wrote one of the best-known books about doga: Barking Buddha: Simple Soul Stretches for Yogi and Dogi. Bryan says dogs make the perfect yoga companions. Chaturanaga: Your dog lies on his/her stomach while you stroke their back. Chair: You hold your dog from behind while it’s in the sitting position and raise the front paws in the air. Inner Dog Mudra: Rest your forehead on your dog’s forehead and connect the energy of your minds. Bryan created this one. But is the dog really doing yoga with you. Or is this just another attempt by pet parents to ascribe human characterizes to their dogs? “It’s the humans convincing themselves that it’s a really cool thing to do with their pooch,” said award-winning trainer Bill Berloni of Theatrical Animals, who works with TV, movie and Broadway producers. He took time out of rehearsals for "Bullets Over Broadway" to talk with NBC News. Berloni doesn’t see anything wrong with bringing your dog to yoga classes, if your pet has a good time there and isn’t getting stressed by the experience. Spending quality time with your pooch and making a physical connection are both important, but it doesn’t have to be done in a doga class, he says. “You could go for a walk and sit under a tree and read and pet your dog and it would probably be as pleasurable an experience,” he said. As you’d expect, the people who teach doga strongly disagree. Suzi Teitelman of Doga Dog is one of the pioneers of doga. She started teaching in Manhattan back in 2002. She now lives in Jacksonville Beach, Fla., and often holds classes on the beach. It’s great to take your dog for a walk or play fetch in the yard, but it’s not the same as doga, she said. Dan Moorefield and his dog Gracie, a 7-year old Maltese, have taken doga classes with Teitelman. “It’s good for us, why wouldn’t it be good for them?” he asked. “You have them stretch their legs and put them in certain positions. Doga provides exercise for parts of Gracie's body that could never be done otherwise. Doga isn’t just an American thing. It’s being done around the world. Doggie yoga is very popular in Japan, as well as England and Australia. In the U.S., it’s taught at health clubs, animal rescue shelters – even posh hotels. Annie Appleby holds a monthly doga class at the Ritz Carlton in Half Moon Bay, Calif. It’s part of the hotel’s Yappy Hour, where people can bring their pets to play on the hotel’s lawn. Appleby, who founded YogaForce, a company that designs and sells yoga clothing and mats, started doing doga a few years ago after she adopted a Pomeranian puppy named Madison. Now she teaches it. She strongly believes any dog can do doga. Here are a few things to keep in mind if you decide to try doga. There is no certification for instructors and the classes tend to vary greatly. At some, the dogs just hang out with their people while they do yoga. At others, the dogs are active participants, yoga partners. Most classes cost $15-$25 for an hour session. Private lessons are more. Dogs of any size can do this. Even though a lot of publicity photos show people lifting their dogs over their heads or onto their back, that’s not required. Gentle stretching is just fine. You should never force a dog to do a specific pose. You do doga to bond and build trust. Nothing about this should be unpleasant or scary for your dog. If for any reason they resist – stop. And even if doga really isn’t yoga, it’s definitely a way to get closer to your four-legged family member. “Who doesn’t want to get stretched and massaged and paid attention to for an hour?” Bryan asks. Herb Weisbaum is The ConsumerMan. Follow him on Facebook and Twitter or visit The ConsumerMan website. Herb is a huge animal lover who has worked with local shelters and rescue organizations in the Seattle area. He currently volunteers at Homeward Pet in Woodinville, Wash.